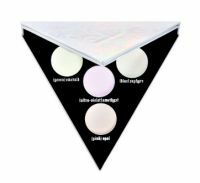 This is a really fun product -- from the triangle-shaped palette to the pretty pastel highlighter shades. I just don't think it's for me. For everyday use, I prefer a neutral-toned highlighter. Though these would be pretty for a night out! Also, I wish that there was a little more product in the palette. These holographic colors look so unwearable in the palette but are surprisingly wearable. I can't get over how little product you need either. A light swipe with a fan brush is all I need for a Instagram-worthy highlight. And it lasts and lasts and lasts. These shades are so gorgeous! I'm obsessed with anything opalescent or irridescent and these shades just really make your cheekbones or browbones shine. Color lasted all day and garnered a lot a compliments. I especially love the pink opal shade!